Are you a teacher, Brown Owl, Scout Leader or parent? 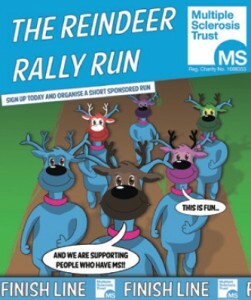 We are looking for schools or groups to get involved this winter in the MS Trust’s first Reindeer Rally. The Reindeer Rally is a great way for young children to get involved in raising money for the MS Trust. When you sign up you will receive a free fundraising kit which includes a reindeer mask for each child to design and wear for a short sponsored race. It’s up to you when you decide to hold your Reindeer Rally. Race day will involve the children wearing their masks while taking part in either a short sponsored run or an obstacle course – the choice is yours! The children will use the sponsorship forms provided to raise money for the MS Trust. To order your free fundraising kit which includes a reindeer mask for each child, sponsor forms, balloons, posters and a copy of our Kids’ guide to MS, please visit mstrust.org.uk/reindeer, email fundraising@mstrust.org.uk or call 01462 476707. GO REINDEERS GO! MS Trust Christmas cards are on sale now with fantastic new designs to choose from. Every card you send helps to raise awareness of MS and the MS Trust. Dress up in your free Santa suit and run, jog, walk or use your wheelchair or scooter to get around the 5km or 10km route in Victoria Park on 7 December. Ski or snowboard the height of Mount Everest every day in our exclusive Monster Ski challenge, taking place from 13–17 March 2015. Cycling through beautiful English villages and into the stunning countryside of rural France will be an experience you will never forget. Various dates available for rides in 2015. Cycle 100 miles on closed roads from London to Surrey on 2 August 2015. This event is getting bigger and better every year so get on your bike and join in!